I love this fabric and pattern for my white bedroom with blue accents. It does block the sun. I would recommend these. Alter the ambiance of your living room, and accompany it with the alluring floral design of these room- darkening curtain panels. These 100-percent polyester curtain panels provide welcome privacy and are machine-washable. Dimensions 9.0 In. X 15.0 In. X 16.0 In. The panels look great in my bedroom .... color is spot on with the Safavieh Retro Mid-Century Modern Abstract Light Blue/Blue Distressed Rug. However they are not what I would call room darkening.... more light filtering.... I have blinds in the windows already and I was trying to reduce the light even more - this does not do it. Also, the sizing was off on the panels.... I purchased 4 sets of panels and they were each off just a bit in length. Also Also, keep in mind that the length stated is overall length.... meaning that the rod must be lowered by about 3 inches to accommodate the head rail and the gather (if sheered on pole.) So measure before hanging the rod. But the color and pattern worked great so I will definitely keep them. These are a lovely quality and the room darkening feature is a bonus. They are such a lovely crisp white and blue pattern that I never thought they would effectively darken the room. They sure did their job! Stunning! Much better then I expected. Beautiful, vibrant colors and very good fabric quality. Curtains have a nice backing and thickness. Highly recommend! Nice, quality curtains. Heavy panels, with bright vivid print. I love this curtain panel because this is a real deal. The color of this panel is what you see on the picture. The fabric was thick, soft and feels like silk or sateen material. I like that the width of this panel is wider than normal. It looks very clean and adds spring atmosphere in my living room/dining room area. Most specially, this was also on sale when I ordered it.This blue panel looks great on my yellow painted wall.I highly recommend this to everyone who wants to have a modern and looks expensive curtains. This are nice curtains. Fuller than most panels which is nice. They have a satin finish which I do not love and they are not complete room darkening. Over all a nice product. Colors true royal blue and white. Hesitated to order because of the poor sizing description but figured I could always return if I needed to. The package contains 2 panels which are 52 in wide EACH for a total of 104 inches. Haven't hung them yet but the fabric is very nice and will dress up the windows in my small breakfast room. These curtains are absolutely beautiful. I have them in my living room and I really like the privacy they provide. The colors work perfectly with the other blue items I have. These curtains are a PAIR not a single panel. They do run a bit off on measurements which I was not happy to learn. However, these are beautiful and luxurious. The curtain is heavy fabric and the deep blue flowers coming off the bright white background is gorgeous. These are beautiful curtains! I bought them for my mother's room (with her help choosing them) and they really look so lovely against the white walls. A beautiful shade of blue, and excellent quality. I also find that if you sleep in that room, they block out the light very well. A great purchase overall! Very happy with these curtains. They were exactly as pictured. Love them, and would order again! They are perfect!!! They are a heavy duty material that will last for years to come. I will definitely purchase this brand again and will recommend to my friends and family. Beautiful drapes. Color true to photo. The print is very crisp. Bright white background. We are using in our dining room. 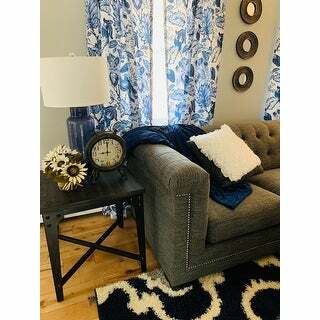 Print complements blue and white theme. Perfect match for living room color scheme. Really nice quality. I have not hung the curtains yet. But from the look of them ; I opened one. I did not unfold it , they look beautiful! The fabric exquisite. I can't wait until I find the right comforter set to go with them. I am taking my time. As these will last as long as I do. Fantastic! Adds real elegance to our kitchen! 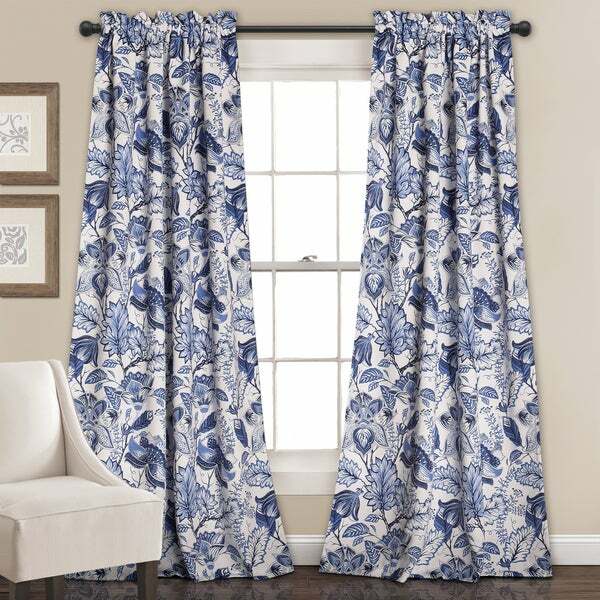 I purchase a pair of these curtains now I'm going to purchase more curtains. They match my rugs. Look very nice in my home. They are a room darker. I will give it 5 stars. Much nicer then anticipated. Look great and are well made. "The only choice is “Blue.” Yet the options state “blue and yellow” and “blue and white.” What will I get if I order BLUE? Thank you. " "Are these available in a length more than 84 in.?" Not currently but we are always looking to possibly expand available sizes. "I see that the curtain panels are 84" long and it says 52" wide. Is that 52" wide for each of the 2 panels?" Yes, each panel is 52 inches wide, you'll love the material as well... rich colors and very vibrant. 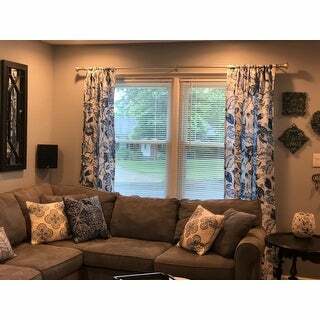 "I like the pattern, but these curtains are too narrow for my windows. Would I be able to get a custom size?" Unfortunately, we do not offer custom options for this item. "What does the back side of the panel look like? Is it white? Need to know how it will look to the street." Back side of this curtain is plain Blue color as the front. The back is white ...no print. the set of curtains I purchased are white on the backside... NOT blue. Colors are very vibrant and should blend well with bed spread. "I need to ask, although it has been asked and maybe answered below, is the price quoted for one panel? A pair is two of anything, and the description states pair. I am confused and I do not want to buy more than I need, nor less than I need. Please answer this question, so I may understand clearly what is the price per one panel. Thank you."